Lot:1139 1795 Capped Bust Right Half Eagle. Small Eagle. BD-6. Rarity-5. Second S/D in STATES. AU-53 (NGC). 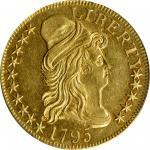 1795 Capped Bust Right Half Eagle. Small Eagle. BD-6. Rarity-5. Second S/D in STATES. 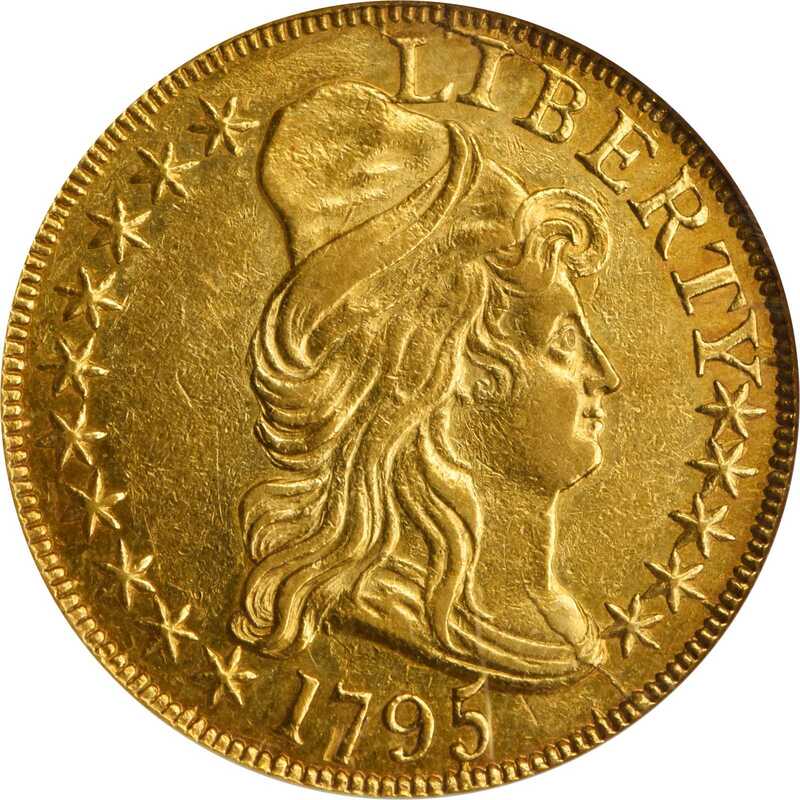 AU-53 (NGC).The 1795 half eagle represents the first federal gold issue and carries tremendous numismatic and historic significance. This attractive piece exhibits rose-orange peripheral iridescence around warmer deep gold centers. The strike is well-balanced and uncommonly sharp for an early half eagle, with the dentils crisp and even the central high points nearly full. Blessed with smooth surfaces and plenty of satin to semi-reflective luster, this is a visually superior 1795 Small Eagle half eagle for the grade. On the reverse of the offered coin, the engraver made an error, first entering STATED and then changing the erroneous D to an S. This reverse also appears in the BD-5 combination, though only a dozen or so examples of that die marriage are known.pThe half eagle denomination was authorized by the Act of April 2, 1792, though actual coinage did not begin until 1795 as there were difficulties posting surety bonds for two Mint officers charged with handling precious metals. As a design type, the Capped Bust Right, Small Eagle half eagles were struck dated 1795 through 1798, though the 1798 Small Eagle issue is a rare prize with fewer than 10 examples known. As might be expected, many collectors strive to acquire the first year of issue, 1795, placing extra burden on the already thin population. 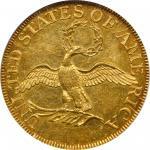 pOffering a modest beginning in the denomination of 8,707 pieces, the 1795 Small Eagle $5 was the first gold coinage produced at the Philadelphia Mint -- copper coinage began in 1793, with silver following in 1794. The report mintage figure of 8,707 cannot be considered final, as multiple dies were made, some of which were used in later years without specific records being kept. Indeed, there are 12 known die pairings used to strike the 1795 Small Eagle half eagles. The present BD-6 variety is decidedly scarce with perhaps 80 to 100 examples known in all grades.Ex Rare Coins of New Hampshire, Inc., December 1998; our sale of Dr. Richard Aghababians Early Impressions Collection, August 2014, lot 13200.